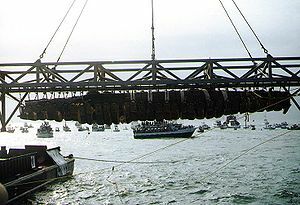 Lee had been searching for the Hunley for some time in the area between the Housatonic and Sullivan’s Island. After sinking the Housatonic, the Hunley would have passed through this area as it returned to its pier. For over 100 years, people had searched this corridor, and a few had claimed to have found the Hunley. P. T. Barnum had something to do with the many people who claimed to have found the little submarine. 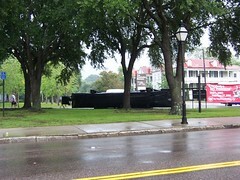 Each one wanting to claim the $100,000 Barnum had put up for the Hunley. 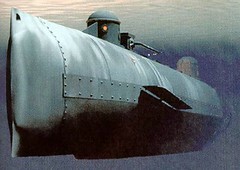 Barnum intended to put the submarine in his museum in New York City. Though many claimed to have found the sub, no one ever presented proof of their find, and Mr. Barnum kept his money. In 1970, Dr. Spence was taking a break from his search for the Hunley, and enjoying a day of fishing when one of the party’s traps snag on something on the harbor bottom. 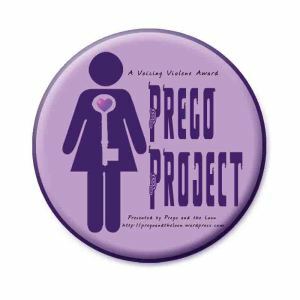 He knew that there should not have been anything in the immediate area for a trap to snag on. Lee borrowed Joe Porcelli’s diving gear; he did not have his gear with him (they were fishing from Joe’s boat, the Miss Inah). After looking at the chart and their location, Lee felt it must be something from the Housatonic that snagged the trap. Now Lee’s curiosity was up, he had to see what the trap was caught on. Diving in cold water without a wetsuit or even a dry-suit can be life threatening, but Lee was going. The visibility was poor, but soon Lee saw the trap caught on what looked like a limestone ledge. The bedrock limestone, in this location, should be 100 feet or more under the sand; it did not make sense. Then his many years of experience in the field of underwater archaeology paid-off, he realized he was looking at Civil War era encrusted iron. 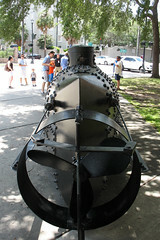 The currents had swept away enough of the sand from the wreck that Lee believed he was looking at the Hunley. There was nothing else this size from that time period it could be. He was so excited he ignored all the diving safety rules and raced all the way to the surface screaming, “I’ve found the Hunley!” Unfortunately, Lee did not have a camera that could take photographs in the poor visibility, nor did he bring up anything from the wreck (I will go into this more in next week’s article Spence VS, Cussler: Who found the Hunley?). I can understand Doctor Spence’s frustration. While on a pleasure snorkeling trip in Jamaica, I discovered a ballast pile that is probably an unknown wreck, but I too did not have a camera (I will write about this in the future). The 1970’s were a pre-GPS era. So, Lee took sightings from various landmarks on shore using a magnetic compass. Then as the Miss Inah went back to the dock, he carefully recorded the boats heading, speed, and time on each course, so he could get back to the site again. Dr. Spence found his first five shipwrecks when he was 12 years old. 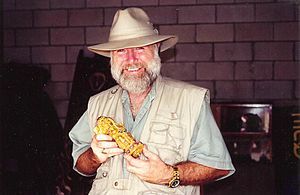 In 1991 & 1992, he served as the Chief of Underwater Archeology for San Andres y Providencia, a 40,000 square mile area in the western Caribbean owned by Colombia. Dr Spence has worked on hundreds of wrecks from ancient times to modern, all over the world. Dr. Spence is one of five people in the world with a Doctor of Marine Histories (College of Marine Arts, 1972). Doctor Spence’s awards and honors are numerous, and from around the world. He has survived numerous calamities while on sites, including: being shot at, running out of air underwater, pinned under wreckage, and caught in fish nets, to name just a few. Lee is also a published editor and author of numerous non-fiction books, and has been a magazine editor and publisher of at least five different magazines. If it were said that Dr. Spence was the role model used to create the Indian Jones character, it would not be surprising. I would like to take a moment to thank Doctor Edward Lee Spence for all of his contributions to diving, underwater archaeology, and education. On a personal note, Doctor Spence has been a pioneer, and casts a shadow over a field that has enthralled me since my childhood, and continues to do so today. To learn more about Dr. Spence’s discovery of the H.L. Hunley we recommend Treasures of the Confederate Coast: The ‘Real Rhett Butler’ and Other Revelations by Edward Lee Spence. This is not one of the articles in the Hunley series, it is an apology. In my articles I always try to walk the fine line between sharing new information and “talking down” to my readers (I don’t like it when people do that to me either). People today are so very informed about a wide variety of subjects. The problem is that sometimes I forget that some things are not common knowledge. The Hunley‘s blue light is just such a case. Some sources inter-change blue light and blue lantern. This is incorrect. 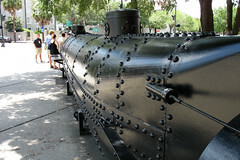 The Hunley did have a lantern on board, but they did not use the lantern to give the famous blue light signal. At that time, blue light, was a term that described a signal flare that gave off a blue light. The blue light can be seen for about 4 miles at sea and a lantern can be seen for about 1 mile. 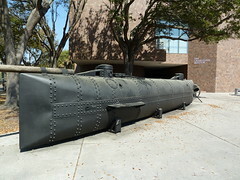 Many people who searched for the Hunley also did not understand this difference, which led them to search for the Hunley in the wrong location. Chris Rucker wrote a very good and surprisingly short article on this topic ( here is the link http://civilwartalk.com/threads/h-l-hunleys-blue-lantern-myth.64150/ ). Chris has conducted research using the orignal ingredients for the Civil War area flare, and shared his research on YouTube.com (the video titles are in his article). Chris’ research on this topic will be shared in a longer article in the first issue of Civil War Navy magazine. I apologize that I was not more specific in my article. Thank you Chris for sharing your knowledge and efforts with us all.